We caught up with Dani Zeiler, a local great 8 student who has decided to share some of her Bat Mitzvah gifts with Shoresh. Dani has an awesome older sister and the most adorable fluffy dog. Dani loves her family, school, and almost anything to do with nature. She enjoys planting in the garden with her dad in the spring. She is passionate about bees and honey, and everything in between. Dani spends her free time exploring the outdoors, hanging with her family, honing her photography skills, and creating with Adobe Photoshop and Illustrator. 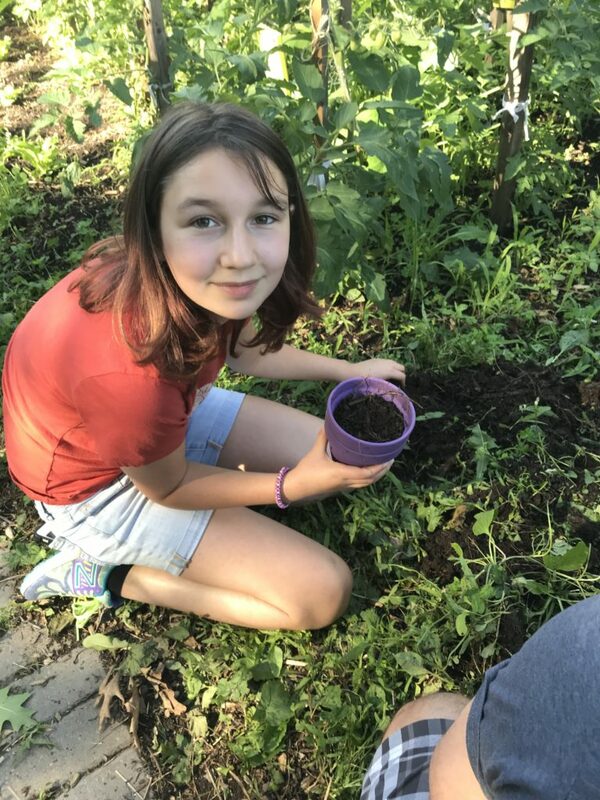 For her bat mitzvah, Dani chose Shoresh as her mitzvah project, and through bake sales and education, raised enough money to build and support a beehive at Bela Farm. In the future, Dani hopes to continue learning about making the world a better, more sustainable, beautiful place to live. What inspired you to raise money for Shoresh’s community Supported Beekeeping program as part of your Bat Mitzvah? All throughout my life, I have been very fond of nature and, specifically, the bees. Every spring, I help my dad plant many different crops in our backyard, from flowers to help bees and other insects pollinate, to fruits and vegetables for us to eat. Also, I have always loved honey and I ask for honey instead of sugar to add sweetness to my tea. When I found out that we are losing the bee population at a very fast rate, I was really concerned and thought that I needed to help. My mom had introduced me to Shoresh (and this specific program) and I thought that this was a perfect choice for my Bat Mitzvah project. Why did you specifically choose to help support the bees? Bees are a very important part of my life and important to everyone else’s lives. They do so much to help the environment and it would be very difficult living without them. I had worked with Shoresh’s Executive Director, Risa Alyson Cooper to see which projects were best for me and when I found out I could fundraise for the bees, I was very excited. Bees do so much, including pollinating about 80% of the world’s crops, making honey and helping ecosystems thrive through pollination. Without bees, there would be almost no crops or honey for us to eat! Every single beehive in Shoresh’s farm can pollinate up to 300 million flowers a day! Every single beehive around makes the bee population increase and that is why I chose to support the bees. If you could ask the adults of today to create a better future for tomorrow, what are three things you’d ask us to do? Pollution is a big problem today and for tomorrow, this is why we need to do something about it. I believe that adults and kids can both be doing our part to make pollution not a problem for generations to come. One of the ways that they can help is using the three R’s that were taught in school. They are Reducing (just don’t buy plastics and other things that are harmful to the environment), Reusing (reuse everything that you can so we don’t end up with so much garbage all over the world), and Recycling (if those two things are not possible, we can take materials and turn it into something else that we can use instead of just throwing it out). Another way to reduce pollution is to walk, bike, or use public transit to get places. This is often quicker than waiting in traffic and with fewer cars on the road, there would be less air pollution. The easiest way to reduce pollution is by turning off things that waste energy. For example, turning off lights when they are not in use. This saves energy and energy costs as well as reducing the amount that energy producers have to make (many energy producers are still creating energy in ways that are harmful to the environment). If we all do these simple things, there would already be a start to making the world a better place for future generations. What do you think as Jews we should be doing to support and nurture the earth, our home? I believe that there are many things that Jews can be doing to support nature and the earth. Some of those things are mentioned in the previous response but there are many others including planting crops in your backyard to increase air quality and help nature all around you (if you cannot do this you can place flower pots on your balcony or inside your home), reduce our meat consumption because many meats are produced in farms that produce greenhouse gasses, make sure that we are not using more water than we need. Much of the world does not have healthy drinking water or they hardly have any water at all. In Canada, we are so lucky to have readily available freshwater but we could be giving it to those in need instead of using it all. We could also be using less paper and other products that come from trees. Trees are very important because they take the carbon dioxide that we breathe out and turn it into oxygen that we breathe in, this is why they are called “the lungs of the earth”. We can use reusable containers instead of ones that we throw away after one use. We can be mindful of what we throw in the trash (we can use the recycling and compost bins instead of throwing everything in the trash). We can fix broken items instead of throwing them out or simply borrowing things instead of buying new ones. Overall, these are some of the many things that we can be doing to help the environment. What is your wish for the bees? I am hoping that in the future the bee population will increase, I hope that more and more crops can be pollinated by bees, and I hope that lots of honey is being produced by the bigger bee population. Overall, I believe that with more bees in this earth many great things will happen. What do you hope the impact of your generous donation will be? I hope that the impact of my donation help the bee population grow, I hope that it will help Shoresh’s farms with all crops and producing pure honey, and I hope that it will give a positive impact to the community and to all nature around us. On behalf of Shoresh, we wish you a hearty mazel tov and are so grateful for your caring heart and generous spirit. We are here to support you, Dani and to help you create a better future for all living things. To learn more about our B’nai Mitzvah projects, click here.